Tantalum pentoxide (Ta2O5) is a metal oxide ceramic with a wide range of uses in industrial applications. Tantalum is a naturally occurring element found primarily in the minerals tantalite and columbite, and rarely in nature as its native form tantite. These tantalum ores are treated and refined to yield tantalum metal which is then calcined to produce the oxide form. Tantalum pentoxide has specific properties that make it intriguing for multiple industrial purposes. In amorphous form, it produces a high index of refraction. In both amorphous and crystalline formations, it produces a high band gap. Utilizing these properties, Ta2O5 has been used in the manufacturing of optical lenses to achieve the desired refractive index, Abbe number, and even color distribution. It can be used as a co-dopant in the production of lithium tantalite single crystals which can be modified into surface acoustic wave filters used in smartphones and GPS devices to enable very precise frequency control. More commonly, Ta2O5 is used in electronic applications due to its high band gap and dielectric constant, specifically with use in capacitors. They are found in automotive electronics, electronic circuitry and other thin film components. Tantalum pentoxide is regularly used as a filler material in dental materials due to its strengthening effect and its radiopacity which is the ability to stop or reduce the passage of X-rays. The radiopacity of dental implants is important in a practical manner as it allows the dentist to more easily distinguish the restorative materials from other features during dental x-rays. Modern dental repairs are made from resin based materials which are primarily of only light elements, and thus have their radiopacity only due to the additives such as the filler. The fillers incorporate both ceramic and glass particles containing heavy metals which will alter the radiopacity of the material based on the size and concentrations of the filler material. Ta2O5 is a promising filler material for improving both the radiopacity and strength properties of modern dental materials. The Ta2O5 particles are typically mixed with SiO2 particles in a specific mixture to achieve the desired radiopacity. The higher mol% of Ta2O5 in the mixture, the higher the radiopacity. This is but one factor that needs to be considered. The look of the dental implant, strength and surface quality are other key factors that can be influenced by the particle size. For many industrial materials, including those placed within one’s body, mechanical strength is vital. Both the particle size and the particle size distribution impact the mechanical strength and properties of a given material. Many materials start from a powder form and eventually are processed and densified to a final form. The packing of large powders and powders of irregular shapes can create voids between particles and create regions of high stress concentration, meaning that there must be a reasonable distribution of different particle sizes to ensure adequate packing. Smaller particles provide benefits in processing rates and appear to increase strength and other properties; nanoparticles in particular seem to offer promising improvements in strength and other mechanical properties. For dental fillers, larger particles can increase the stress in a dental repair as well as tend to wear faster, causing a reduction in the shine and luster of a replacement tooth. Another key factor is the adherence of the dental filler to the existing remaining tooth materials. Dental research has indicated benefits in adherence with reduced filler particle size so the industry has trended towards “nano” sized particles to aid in the resins and fillers ability to adhere to its new surface. The ability to produce nano-sized particles with high concentrations of Ta2O5 is useful in producing mechanically strong materials with the appropriate radiopacity. The data shown in figure 1 below displays the measured particle size distribution of the Ta2O5 particles. This particular sample has a very tight distribution centered at ~ 8 µm with a standard deviation of 3.31 µm, producing a typical distribution curve for a processed ceramic powder. This sample was for use in dental materials as a part of a study to better understand the particle size behavior. While this sample was still in the micron size range, future samples were intended to be milled and treated to finer sizes while still retaining a tight particle size distribution. The size at which a certain portion of the distribution is under (D10, D50, D90 are common particle size specifications) can be easy evaluated from particle size data as well as common statistical information such as the mean, median and mode. The goal for a project such as this would be to find the range where the desired radiopacity is achieved, but the particles are fine enough for the improved mechanical properties and the distribution limits any large particles. 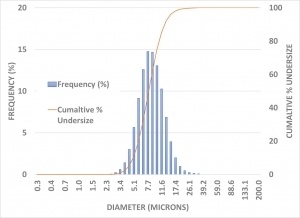 The proper combination of sizes should lead to more than adequate mechanical properties as well as the desired radiopacity based on the both the size of the Ta2O5 particles and the appropriate concentrations. There are also many different applications and classes of dental materials and each may need specific particle sizes in order to maximize all the required end properties. Utilizing particle size analysis allows for an easy methodology and characterization method to ensure proper understanding during research and in the process control required during actual production.